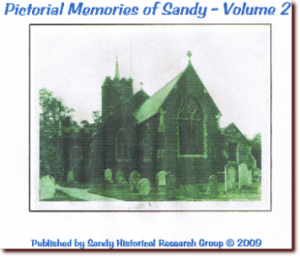 Sandy Historical Research Group has published the 2nd edition of,‘Pictorial Memories of Sandy’, which was officially launched on Monday 2nd November 2009. 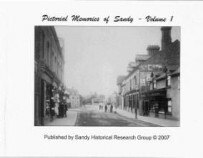 The book contains another 40 or so views and images of Sandy life, this time categorized into sections covering Sport, Agriculture, Local Pubs and Buildings. A number of the new images have not been seen in public before and show Sandy in a more rural age. Click here to see photos of the book launch, which was held at Sandy Library and attended by Sandy Town Mayor, Geoff White. In addition, for those of you requiring additional copies of Vol 1, we are offering this at a reduced price of £6.99, if ordered together with Vol 2. Fill out the order form together with your name & address and the name and address of the recipient (if not your own). We will despatch your book(s) by Royal Mail). NB: Please allow 5 working days for cheques & Postal Orders to clear. Postage & Packaging is free to UK mainland destinations. (See below for offshore or overseas charges). 2. NB: PayPal service not currently available. NB: All the above rates are correct as at 30th March 2015 and subject to change. The above charges are based on UK Royal Mail ‘Standard’ Rates. If you require additional insurance or tracking – please get in touch. A set of 8 Postcard views is available from the group @ £3.50. Please add 75p for postage to UK Mainland destinations. For availability & cost of back copies of ‘SHRUB’, please get in touch.